Country music boasts a long tradition of rich, contradictory gender dynamics, creating a world where Kitty Wells could play the demure housewife and the honky-tonk angel simultaneously, Dolly Parton could move from traditionalist "girl singer" to outspoken trans rights advocate, and current radio playlists can alternate between the reckless masculinity of bro-country and the adolescent girlishness of Taylor Swift. 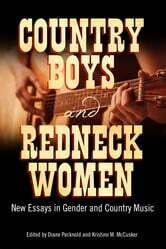 In this follow-up volume to A Boy Named Sue, some of the leading authors in the field of country music studies reexamine the place of gender in country music, considering the ways country artists and listeners have negotiated gender and sexuality through their music and how gender has shaped the way that music is made and heard. In addition to shedding new light on such legends as Wells, Parton, Loretta Lynn, and Charley Pride, it traces more recent shifts in gender politics through the performances of such contemporary luminaries as Swift, Gretchen Wilson, and Blake Shelton. The book also explores the intersections of gender, race, class, and nationality in a host of less expected contexts, including the prisons of WWII-era Texas, where the members of the Goree All-Girl String Band became the unlikeliest of radio stars; the studios and offices of Plantation Records, where Jeannie C. Riley and Linda Martell challenged the social hierarchies of a changing South in the 1960s; and the burgeoning cities of present-day Brazil, where "college country" has become one way of negotiating masculinity in an age of economic and social instability.